The bottled herbal tea market in Malaysia is small compared to Asian drinks. The line between the two is not well defined. Apart from some imported brands such as Hong Kong’s Hung Fook Tong and China’s Jia Duo Bao, there is a domestic equivalent of Jia Duo Bao, which is Tan Ngan Lo currently available in both bottled and tea sachet format. Generally, Malaysian consumers will go for Asian drinks when they want to cool down the healthy way. There is a plethora of popular bottled Asian drinks and cooling water in the market. Moreover, consumers can also access a wide range of herbal tea and Asian drinks at hawker centers. For those who want to consume more authentic herbal tea, the Koong Woh Tong outlet is available in most leading shopping malls offering the famous Wong Lo Kat, which has a bitter taste, and the slightly sweetened Five Flower Herbal Tea. 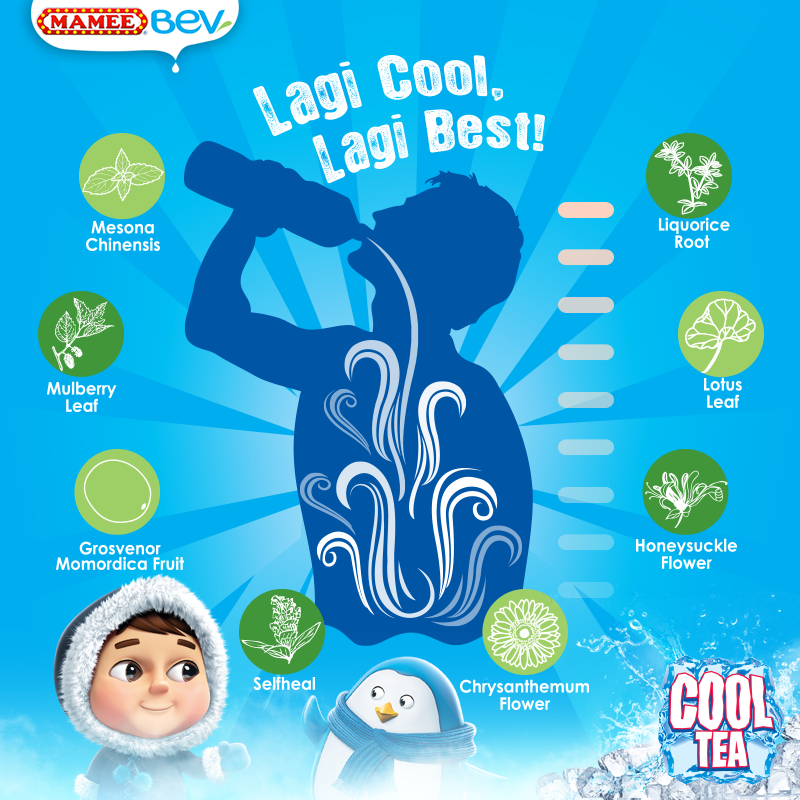 It is in this market that the new Mamee Bev Cool Tea made its debut in Malaysia in early May 2015. Cool Tea’s key ingredients are mulberry leaf, lotus leaf, liquorice root, honeysuckle flower, chrysanthemum flower, selfheal, grosvenor momordica fruit (lo han guo) and mesona chinensis (grass jelly). The drink claims to release the body heat and is ideally consumed when one is eating BBQ, spicy food or engaging in outdoor activities. Personally, I find Cool Tea has a very strong grass jelly taste and is very sweet. My view is Mamee Double-Decker is using the Cool Tea herbal tea to penetrate the Malay market, which represents a huge untapped market since Bumiputera accounts for over two-thirds of the population of Malaysia. At the moment, the Malay herbal tea market is underserved by existing products in the market, which are geared towards Chinese consumers who already have a strong tradition of consuming herbal tea. Malay is the key communication language for Cool Tea. Of the 10 Facebook postings since the site was officially launched on 5 May 2015, 8 FB posts were written in Malay. This strengthens the conviction that Cool Tea is reaching out to the Malay segment. Mamee’s latest entry into the herbal tea segment is seen as positive as it is building a new category with the Malay consumers. As Malay consumers increasingly adopt a healthy lifestyle, herbal tea has a strong potential to meet their needs for a healthy drink for thirst-quenching moment.